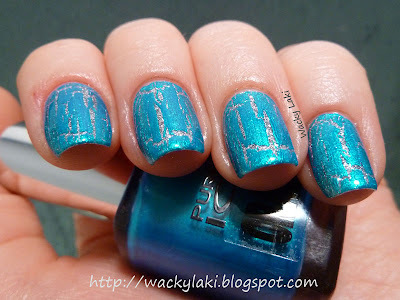 UPDATE: Thanks to the information from a lovely reader, the glitter polish actually has a name of Beware. I know everyone is over the crackles, but I'm quite impressed with the ones I have tried from Pure Ice. 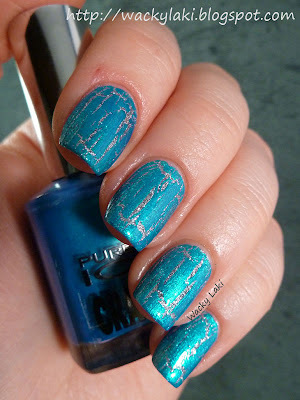 The combos go so well together and this metallic teal crackle is a stunner. I'm just thinking of how it would look over a dark polish... hmm! If you missed my previous two reviews, check out the Gold Glitter with Black Crackle and Gold with Red Crackle. That silver is called Beware in case your still wondering.